Welcome in Lefkada! One of the most beautiful islands, which combines the pleasures of green mountains and the sparkling blue sea. 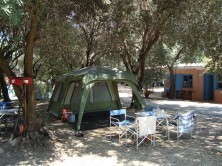 In the East Lefkada, just 7 klm far from the town, into in a seaside and full of green great extent is located the Camping Village Episcopos. It has all the modern facilities and comforts in order to help you by making your stay unforgettable. The Camping Episcopos functions since 1977. It is place in a big extent of natural shadow in the area of Nikiana’s Episcopos just 200m from the sea. It abstains about 7klm from the town of Lefkada and 8klm from Nidri. You can enjoy the natural scenery drinking a coffee or a drink in its beautiful coffee/bar next to the swimming pool.